Aurora Expeditions’ 15-day ‘African Cruise Safari’ departing Johannesburg and starting from AU$7,990 per person twin share. Departure dates: 16-04-15, 05-05-16, 19-05-16. The sun sets, gradually inundating the sky with stunning shades of purple and orange. A herd of elephants and their young have reached the riverbanks to quench their thirst. A few metres away, hippos are peacefully bathing whilst crocodiles slowly appear at the surface, sprinkling the water with their shiny ruby eyes. 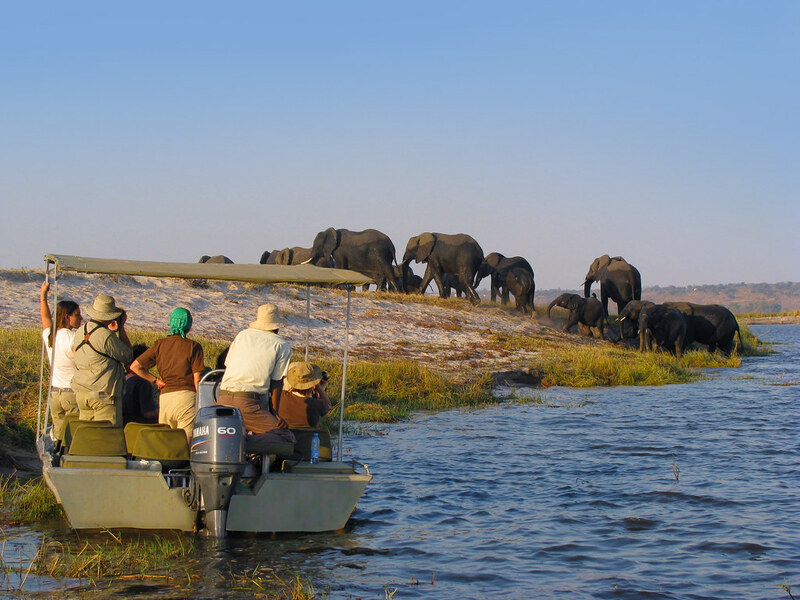 As the ship glides through the waters of the great Chobe River, some of Africa’s most diverse wildlife livens up before your eyes, offering remarkable views while you unwind and relax from your luxury cabin. On board the elegant 28-passenger Zambezi Queen, travellers are offered the opportunity to live a unique game-viewing experience as they sail the banks of the Chobe National Park, boasting one of the densest elephant populations on the African continent and home to a large number of lions, buffalos, hippos, giraffes, crocodiles and abundant birdlife. 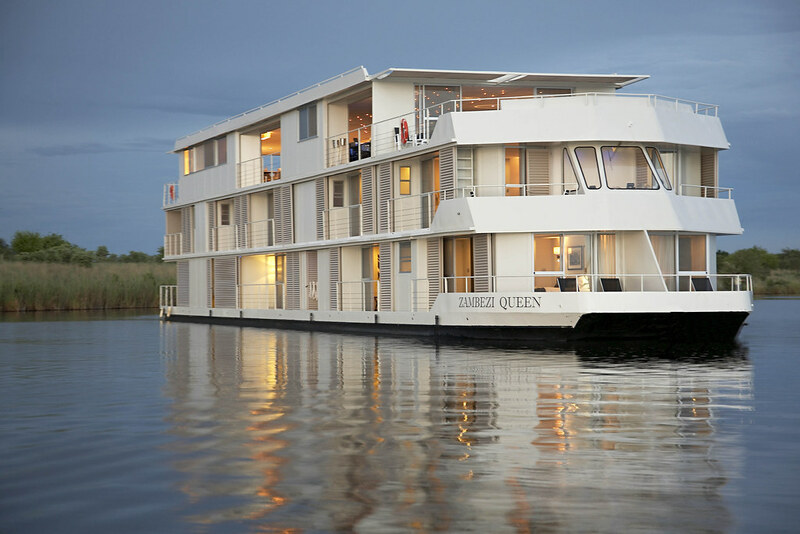 Built in the early 1990’s, the Zambezi Queen features 14 luxury ensuite cabins with a private balcony for stunning open views of the Chobe River and the teeming wildlife that gathers up along its banks every day. An open air bar and lounge also offer opportunities for great wildlife spotting whilst enjoying a glass of wine or some of the upper deck restaurant’s various delights. Adding a sense of adventure to the experience, water-based game drives by tender boats allow you to explore nature at its best! The ship is also equipped with smaller crafts for passengers to venture out in small groups and cruise the riverbanks to get up close with the wildlife as they come to drink and feed. This three-day sailing adventure is just one highlight of Aurora Expeditions’ 15-day African Cruise Safari which spans over three countries including Botswana, Zimbabwe and South Africa. Departing in April 2015, the expedition is led by an Aurora Expeditions naturalist, with a team of local expert guides for an in-depth and genuine African experience. It also includes a three-day stay in cosmopolitan Cape Town, a two-night Victoria Falls stay, land-based safaris in Hwange National Park, lodge stays in Hwange and Chobe National parks, and more. Aurora Expeditions’ Africa Cruise Safari starts from AU$7,990 per person twin share and departs Johannesburg on 16 April 2015, with two more departures set for May 2016. For more information on Aurora Expeditions’.